Clearings for cattle grazing in Paraguay's Chaco. The dry tropical forests of the Gran Chaco are disappearing faster than any other forests on earth, threatening endemic species and one of the last indigenous peoples living in isolation from industrialised society. A number of commodities traded worldwide are driving this destruction. While the role of beef and soya in fuelling deforestation is well known, a new investigation by the British NGO Earthsight has fixed the spotlight on a previously unexamined protagonist: charcoal. Published on 6 July, Earthsight’s report charts the connections between forest clearances in the Paraguayan Chaco and supermarkets in the EU including Lidl, Aldi and Carrefour. The Chaco is described by David Attenborough as “one of the last great wilderness areas in the world.” Encompassing parts of Bolivia, Paraguay and Argentina, it harbours high levels of biodiversity, sheltering 500 species of bird and 150 species of mammal including jaguar, capybara and giant anteater. The region is also home to one of the last indigenous communities in the Americas living in isolation from industrial society, groups of semi-nomadic Ayoreo. Deforestation rates in the Paraguayan Chaco tripled between 2006 and 2007. But all this is threatened by deforestation, driven by the advance of international agribusiness into pristine wilderness. A 2013 study by the University of Maryland, covering the 12 years after 2000, found that the forests of the Gran Chaco were disappearing at a faster rate than any other tropical forests in the world. A closer analysis shows that the majority of this destruction was concentrated in the Paraguayan Chaco, which covers the western half of the country’s landmass. Deforestation rates in the Paraguayan Chaco tripled between 2006 and 2007. They have remained high ever since. This sudden step-change in deforestation was catalysed by a moratorium on forest clearances in Paraguay’s eastern half, which drove cattle ranchers west in search of land. From then on, the conversion of old-growth Chaco forest into pasture has advanced at a dizzying rate. 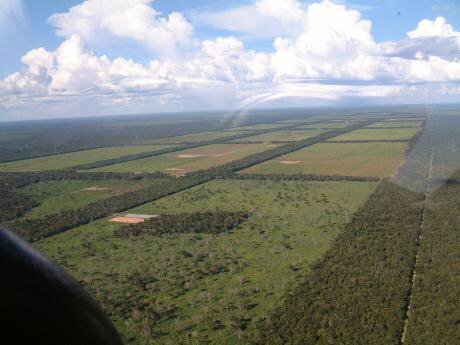 The latest analyses, based on of satellite monitoring performed by the NGO Guyra Paraguay, predicts that the Paraguayan Chaco is set to lose 200,000 hectares of forest this year. Right now, an area the size of Manhattan is being bulldozed every fortnight. In total, Earthsight estimates that as many as 30 football pitches of Chaco forest are being cleared daily to supply Europe with charcoal. The speed of this destruction has triggered grave concern among both conservationists and those charged with protecting indigenous rights. “The clearance of Chaco forest is one of the largest and fastest losses of natural forest ever seen,” the NGO FERN warned in a recent report. The UN Special Rapporteur on the rights of indigenous peoples has spoken of “serious threats posed to groups in isolation by the relentless spread of deforestation.” In 2016 the Inter-American Commission on Human Rights passed a resolution ordering the Paraguayan government to take action to prevent Ayoreo communities living in voluntary isolation from being wiped out by the advance of the agricultural frontier. Behind this turbo-charged deforestation lies a chain of commodity production which provides the global marketplace with three products: beef, soy and charcoal. Paraguay, with a population of just six million people, is the world’s seventh biggest exporter of beef, sixth biggest exporter of soya, and fifth biggest exporter of charcoal. A new report produced by the British NGO Earthsight focuses its analysis on the least examined of these commodities: charcoal. The dense, slow-growing hardwood trees of the Chaco provide high-quality charcoal, which burns hot and slow with little smoke. The most sought-after species is the quebracho blanco, which is also important to indigenous groups such as the Ayoreo, who collect honey from nests in its branches. Earthsight’s report, Choice Cuts: How European & US BBQs are fuelled by a hidden deforestation crisis in South America, examines how quebracho charcoal reaches supermarket shelves in the EU and USA. Export data shows that the EU is by far the largest destination for Paraguayan charcoal, with Germany and the UK the largest buyers. During early 2017, some 22,000 bags of Paraguayan charcoal were entering Germany every day, and 5,000 were entering the UK. In total, Earthsight estimates that as many as 30 football pitches of Chaco forest are being cleared daily to supply Europe with charcoal. To examine how charcoal generated by Chaco deforestation ends up in the hands of EU consumers, Earthsight focused its investigation on Paraguay’s biggest charcoal firm, named Bricapar. During the first four months of 2017, Bricapar was bringing in $1 million a month in revenue from its charcoal sales. Paraguay export data shows that, in that time period, more than 40 percent of all EU charcoal imports from Paraguay were supplied by Bricapar. Bricapar has four charcoal production facilities in Paraguay. Earthsight investigators visited one of these, located in an area of land known as Teniente Ochoa. Teniente Ochoa lies in the municipality of Mariscal Estigarribia which, forest loss records show, has consistently experienced the Chaco’s highest deforestation rates. Signs of the presence of uncontacted Ayoreo have been found just 40 kilometres from Bricapar’s facility. The facility is not easy to find. Situated deep in the Chaco, it lies 500km north of the capital Asuncion: an eight-hour drive up the potholed Transchaco Highway, followed by a left turn along a 20km dirt track, running west through cleared land. At the end of this track lies one of the biggest single sources of the charcoal sold in European supermarkets: a production centre of 80 clay ovens, manned by soot-stained workers sorting piles of quebracho blanco tree trunks the height of trucks. Earthsight estimates that the facility may be producing as much as ten percent of Paraguay’s total charcoal exports. The dramatic disappearance of the forest around the facility is clearly visible in satellite imagery. They show that it was built in late 2015. In the first nine months of 2016, an average of ten football pitches of natural forest were being cleared every working day in the land surrounding it. Further clearances took place in a second farm to the north, subsequently connected to Bricapar’s facility by a newly cut road. Bricapar is also of interest for reasons beyond the forest clearances themselves. It is part-owned by one of the most powerful Ministers in the Paraguayan government, Minister of Public Works Ramón Jiménez Gaona. Goana is currently under investigation for alleged links to a corruption scandal, involving bribes paid by a Spanish construction company for state contracts in South America. The land on which Bricapar’s Teniente Ochoa charcoal facility operates belongs to the Paraguayan Social Security Institute (IPS), a state-managed insurance scheme paid into by workers to cover healthcare, maternity, unemployment and pensions. A 2014 investigation by the Paraguayan national newspaper ABC Color found that the land was being leased to a firm named IRASA for an eighth of its true market value. Bricapar had signed a contract with IRASA to make charcoal on the land in 2012. Bricapar argues further that the clearances have been authorised by the Paraguayan Forestry Institute (INFONA), and comply with all relevant regulations: the conservation of forest on 25 percent of the total land area; buffer strips of forest around each block of land clearance; protection of forest close to water sources; and 30 percent of standing trees left upright to serve as seed trees and provide shelter for cattle. Satellite images suggest that these regulations have been broadly complied with. However, they also clearly show that, within the areas of the IRASA lease where Bricapar is sourcing its charcoal (separate to the 25 percent forest reserve), while some individual trees are retained, most of the land is being entirely cleared of natural vegetation to make way for cattle pasture. High-resolution satellite images in Earthsight’s report reveal a moonscape of bare earth and bulldozed trees. In relation to the land lease, Bricapar said that it “does not know the fixed price” between IRASA and IPS. It did not respond to requests to demonstrate it was leasing the land at market rates. From its production facility in Teniente Ochoa, Bricapar’s charcoal is transported by truck to a factory near Asuncion. The factory turns some of the raw material – the ‘charcoal dust’ – into briquettes, and packs them and the raw ‘lumpwood’ charcoal into customer-branded packaging ready for export. Earthsight charted the charcoal’s subsequent onward journey into the barbeques of European and US consumers. The marketing and distribution of Bricapar’s charcoal in Europe is handled by a Spanish firm named Ibecosol. Ibecosol began working with Bricapar in 1997, subsequently acquiring a 26% stake in the Paraguayan firm. Consumers, supermarkets and EU legislators will all need to act to prevent the forests of the Chaco disappearing completely. Ibecosol makes a number of false and misleading claims regarding its charcoal products. The website for its CARCOA brand, sold in Spain and Portugal, claims that all its products “are produced using wood from reforestation, pruning or selecting non-forest (shrub) species.” Ibecosol’s CEO told an Earthsight investigator posing as a trade journalist that “we are not using trees, we are not cutting down trees to make briquettes or other products.” All these claims are clearly contradicted by Earthsight’s observations at Bricapar’s Teniente Ochoa facility. Annually, according to Seaone, Ibecosol supplies 20,000 tonnes of charcoal to Germany, 15,000 tonnes to Spain, 7000 tonnes to Denmark and 3000 tonnes to the UK. Seoane said that his Paraguayan charcoal is sold by some of Europe’s leading supermarket chains, including branches of Lidl and Aldi in both Spain and Germany, and branches of Carrefour and Repsol in Spain. He claimed that his company supplies more than half of the charcoal being sold in Spanish shops, including 95% of the charcoal sold in Spanish branches of Carrefour. Presented with Earthsight’s findings, Carrefour agreed to suspend its purchases of some of Ibecosol’s products. Beyond Europe, Bricapar also shipped 2000 tonnes of charcoal to the USA in 2016. Around two-thirds was purchased by the US company Duraflame, by far the largest US importer of charcoal from Paraguay. Duraflame sourced more than 250,000 bags of Cowboy-branded charcoal from Bricapar in 2016. The company’s Vice-President, Chris Caron, told Earthsight these products were sold in stores in the North-East of the United States. He said he was not aware that these products came from clearance of natural forest. Earthsight’s report delves deeply into the role played by charcoal in the clearances of natural forest currently unfolding in the Gran Chaco. But this is only the start of the story. Bricapar is far from the only firm supplying Paraguayan charcoal to Europe. Big K, for example, the UK’s best-known charcoal brand, sources its non-FSC charcoal from a firm named Dolimex. Dolimex boasts on its website that, “100% of our material is from Paraguay Chaco forests.” Big K admitted to Earthsight that its products came from clearance of land for cattle farming but said they understood that it was “bush land”. Moreover, Europe’s complicity goes far beyond charcoal. While charcoal production is an important contributor, the primary driver behind that destruction is industrial-scale beef production. In 2016, EU countries imported €32 million of beef and €56 million of leather from Paraguay. EU imports of beef from Paraguay trebled in 2016, and now represent 10 percent of Paraguay’s total exports. As Earthsight’s report concludes, consumers, supermarkets and EU legislators will all need to act to prevent the forests of the Chaco disappearing completely.